In a summer when all the major blockbusters either fully disappointed or could only be enjoyed with reservations and equivocations, Pacific Rim arrived in the nick of time to save the day. Much like its high-powered heroes, it is a well-oiled, high-tech machine designed to pummel the bloated monsters that would otherwise be its competitors for champion of the season. There are several men of steel in this movie, and, crazily enough, some of those iron men aren't even white, and hell, a couple of them are even women. Guillermo del Toro, director of such disparate modern effects classics as Hellboy and Pan's Labyrinth, turns his visionary gaze towards Japanese anime and monster movies to make the ultimate fanboy mash-up. Pacific Rim is essentially Mobile Suit Gundam versus all of Godzilla's Monster Island. Or to put it in layman's terms, soldiers in massive robot suits fighting huge scary monsters. That's the basic premise of Pacific Rim. And may the cinema bless Guillermo del Toro and writer Travis Beacham for shoving all of that info in the first five minutes. Finally, someone else who has seen The Incredibles and realized we don't need the origin story! Rather, we are dropped in to the ragged tail end of the war against the kaiju. Man's resources are nearly exhausted, and the alien assault is only escalating. A bold and daring plan is needed to, as the trailers so consistently declare, cancel the apocalypse. 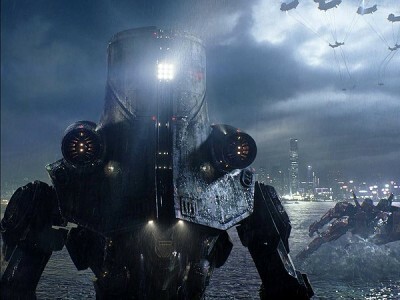 Those factors comprise the human element that give Pacific Rim purpose, and which, at times, is also guaranteed to make the toughest among us all misty eyed, no matter how schmaltzy the emoting may be. (Daddy issues? Dead brothers? This really is just like anime!) Of course, the concerns of the flesh are secondary to the digital effects and explosions and what not. Which there are plenty of in Pacific Rim. del Toro and company are deep in the uncanny valley here. 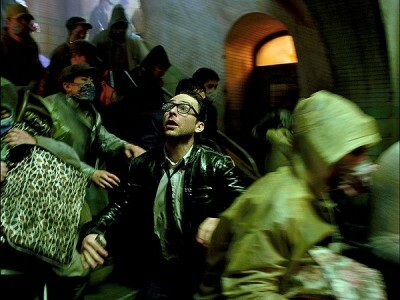 Pacific Rim may well be the uncanny Marianas Trench. The production team has created an impressive and wholly immersive future world where mech and monster alike mingle amongst mankind with nary a seam showing. 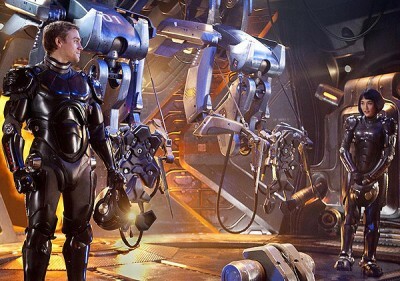 The design is so good, in fact, Pacific Rim is one of the few films I would recommend seeing in 3D. It joins Avatar and Hugo as the rare fiction film shown in 3D that takes full advantage of the tool. That it does so without resorting to darkness, frenetic editing, or any of the other failings that make the majority of 3D films muddy and unwatchable just goes to show how pointless the up-conversion of most movies shot in two dimensions really is. So, yeah. Pacific Rim. Get in line early, and get in line often. Summer is here at last. They're trucking in extra loads of popcorn. The world's going to need it! Order "Pacific Rim (3D)" now!